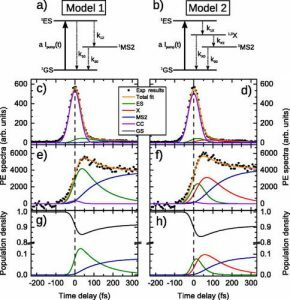 The kinetics of ultrafast photoinduced structural changes in linkage isomers is investigated using Na2[Fe(CN)5NO] as a model complex. The buildup of the metastable side-on configuration of the NO ligand, as well as the electronic energy levels of ground, excited, and metastable states, has been revealed by means of time-resolved extreme UV (XUV) photoelectron spectroscopy in aqueous solution, aided by theoretical calculations. Evidence of a short-lived intermediate state in the isomerization process and its nature are discussed, finding that the complete isomerization process occurs in less than 240 fs after photoexcitation.